After Air which was installed this year at Alton Towers, England still doesn't seem to have slaked its thirst for wild roller coasters. 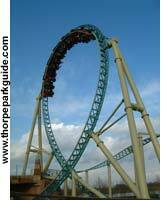 This time it is Colossus at Thorpe Park. The monster of a structure built by the constructors Intamin is being heralded as the first of its kind due to the ten times that one finds oneself turned upside down. If you want specifics: a double cobra-roll, two barrel rolls, five spirals and one vertical loop at a height of about twenty meters. The performance of the coaster is all the more spectacular for the many technical constraints imposed on its construction, notably a limit on its height which could not exceed 30 meters. Contrary to current trends, the two trains are of the rather traditional 28 passenger kind (each with seven cars that seat four people). The 850 meter ride reaches a maximum speed of 65 km/h which is not very high in comparison to other rides but more than enough given the particularities of this ride. And that's not all ladies and gentlemen: for 2003, Thorpe Park has already ordered a suspended roller coaster from the Swiss company Bollinger & Mabillard, the experts in this specific kind of coaster.